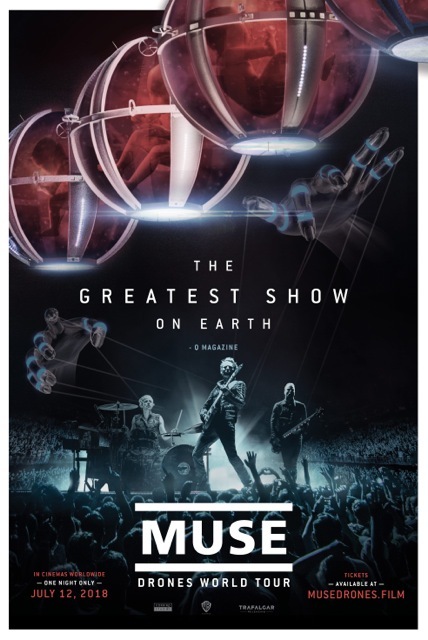 Muse will be releasing their ambitious "Drones World Tour" to cinemas worldwide on July 12 for one night only, through Trafalgar Releasing. Exclusive screenings will bring the globally renowned, multi-platinum-selling band and their Drones 'in the round' spectacular to the big screen. For more information, including screening locations, please visit - musedrones.film. Filmed and recorded over multiple tour dates in 2016, the "Drones World Tour" worldwide release, distributed by Trafalgar Releasing will showcase Muse's career-spanning hits including Psycho, Madness, Uprising, Plug in Baby, Supermassive Black Hole and Knights of Cydonia, amongst others. The film contains never-before-seen special effects which perfectly compliment the creative stage production, ensuring the ultimate audio / visual sensory experience. Matt Bellamy said, "The Drones show reflects the mood and story of the album, we played for the first time in the round, and wanted a show that was stark and spectacular featuring cutting edge autonomous drone technology."